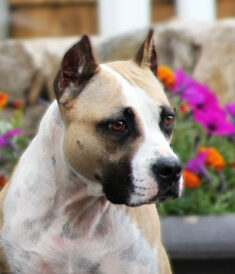 We want to extend a sincere Thank you to Al from Esoteric Amstaffs for our girl Kai! Kai has incredible working ability, focus and drive. Her temperament is solid and she is an extremely quick learner to anything newly introduced. Kai has completed her health testing. Her results can be found on her OFA page. She has also received her CHIC. Kai is continuing to excel in the performance venues, achieving her CAA (coursing ability advanced) and RATO ( rat open-Barn Hunt). We are looking forward to 2018. Kai is ataxia clear by parentage.